Steel vs Aluminum—Which One is the Best for My Business Case? | Awnex inc.
Steel vs Aluminum—Which One is the Best for My Business Case? Steel vs. Aluminum—which one is the best for my business case? Aluminum is today’s favored material due to its unique ability to be formed into endless shapes, inherent strength, light weight, environmental friendliness, ability to hold finishes and its versatility to be incorporated into easily changeable Bolt-On™ units. While Aluminum Architectural Elements have almost no limitation in their ability to be integrated into the structure of the building, creating the design (perhaps for restaurants and retail chain store), the bigger issue with steel is that it permanently sets the building shape, limiting your ability to modify later. In other words, branding/imaging it for life. As a result, modifications to steel can be costly and time consuming. On the other hand, since aluminum components are fashioned into modular “Bolt-On” systems, there is the added advantage of taking one unit down and installing another to re-image or remodel a building without disrupting operations. From a pure installation perspective, Aluminum products are more easily and quickly installed, and can be more easily modified in the field to adjust with building inconsistencies and limitations. One of the more common best practices in construction is violated with steel architectural elements, as they must protrude from the building façade (envelope) for support. The weight of Steel requires steel building structure to support its load. Protruding the building façade allows a greater chance of water penetration into the building. While there are excellent sealers and flashing products on the market, this creates more work and increases the potential of unwanted water and air penetration. Unlike pre-manufactured aluminum components, steel products are typically put together from scratch, on-site. This limits other trades starting their scope, further extending your installation time or delaying opening. Aluminum products are pre-manufactured and can, therefore, be built simultaneously while other trades are completing their scopes of work. What about maintenance? Steel products require more upkeep than aluminum products. 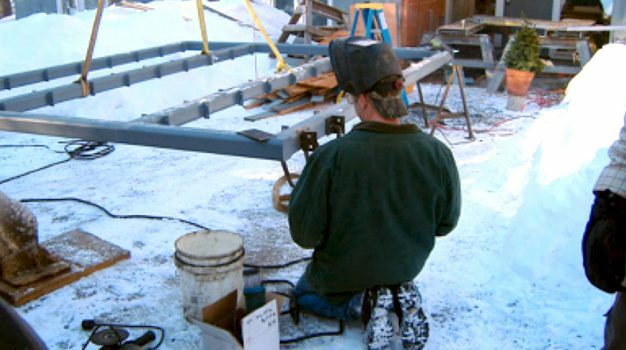 Steel has to be painted on-site after installation and requires re-painting on a regular basis to prevent rust. Aluminum does not rust! Aluminum products can have a variety of pre-painted finishes (Kynar, powder coating, wet paint), which can carry extended warranties. Aluminum products are pre-finished, meaning no other work is required once the product is installed on your building. Aluminum requires minimal to no upkeep except for periodic cleaning with water and mild detergents. We encourage you to send us your architectural element plans to review for possible conversion from Steel to Aluminum, we believe you will switch too!